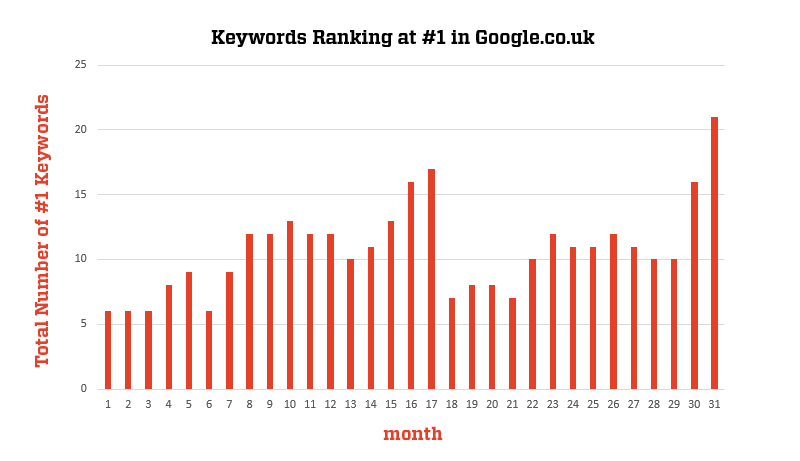 SEO Case Study - More Number 1 Ranked Keywords In Google Than Ever! We’ve been working closely with one of our clients in the legal sector for the past couple of years, managing all their SEO and supporting them with content creation and social media management. We’ve previously written about earlier SEO results we achieved for them, but this month, thanks to our commitment to creating quality content and a focus on local search, we produced results that we couldn’t help but share! Every single one of their tracked metrics, from unique visitors to organic search traffic improved this month. Number 1 in Google for 21 non-brand search terms, up from 16 the previous month, beating their previous record of 17 number 1 keywords. 32 0ut of 34 non-brand keywords rank on the first page of Google.co.uk. Bounce rate down by 17.4% compared to the same period last year. Not bad results eh? If you’d like us to achieve these kinds of results for your website, just get in touch. We can provide you with a comprehensive website audit, advise you on content strategy or handle all your content and SEO for you.